When people think about successful homesteaders, they often think of folks who can raise chickens or grow beautiful gardens. Or maybe people who can skillfully butcher their own pig or make noodles from scratch. 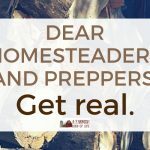 And while these are great skills to have, there is one even more important homesteading skill folks really need to conquer to become a successful homesteader. The most important homesteading skill? The ability to punt. To be completely honest, homesteading is a daily exercise in punting. To succeed in homesteading, you need the ability to creatively figure things out how to make things work when things aren’t working the way they’re supposed to. Woodchucks digging up through the gutters of our barn floor. Clever. Punting means thinking on the fly. Many people joke that a farmer can fix anything with duct tape and baling twine. Why is that? It comes with years of being thrown into situations that need quick fixin’ and only minimal materials to do the fixin’ with. In homesteading, you don’t always have time to contemplate various solutions while drinking a cup of coffee on the porch. When the pigs get out and all you can see are dollar signs running through the neighbor’s field, you don’t have time to consider your options. You think on the fly. Punting means having a way to deal with different outcomes. When your husband suggests that you maybe turn off the heat lamp because the chicks are plenty big enough to not need it (but you’re completely sure they’re going to shiver and die), punting means you have to be okay with turning off the heat lamp and dealing with one of two outcomes: they’re either going to die or they aren’t going to die. Punting is an important homesteading skill, but we have to be clear about what it means. Punting doesn’t mean you’re careless. It doesn’t mean you throw your hands up in the air and say “whatever”. But it does mean you need to be willing to give up a little control. Because in homesteading, you can do all the things perfectly and something might not turn out. You can plant the garden…and the flood can come. And you figure out how to deal with it. You can put the new chickens out in the chicken tractor…and a fox can come. And you figure out how to deal with it. As a homesteader, you have to be at least slightly okay in dealing with various outcomes. Because in homesteading, you very often can’t predict the outcome. I mean, sometimes the broody hen hatches out 12 little puffballs, and other times she leaves the nest before the chicks have even dried off. You just never know. Punting means you’re willing to try different things. Logic states that what worked once will work again next time, and the time after that as well. Friends, Ima let you in on a secret: homesteading isn’t often very logical. At all. One of the biggest homesteading challenges you will deal with is Mother Nature herself. You’re dealing with her time frame. You’re dealing with her weather. You’re also dealing with animals who can sometimes have a mind of their own. A chicken is not a chicken is not a chicken. And that’s the same for pigs, goats, horses, or turkeys. Sometimes what you read on blogs or see on YouTube is not going to work for you and your set up. It’s time to punt! Try something different. Tweak what the blogger or YouTuber suggested and make it work for you. Homesteading encompasses such a wide variety of experiences and situations. There are many ways to make the same thing work, and maybe only one way that will work for you. Keep trying, and don’t listen to the people who tell you that’s not the way to do it. In your situation, it might be the only way to do it. 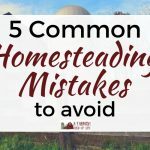 If you’re a control freak, one of two things is going to happen when you become a homesteader: you’re either going to lose your mind, or you’re going to loosen up. The ability to punt really is the most important homesteading skill, and it’s a skill you’ll use no matter where you are in your homesteading journey. You have no idea how much I needed to read this right now! I’m sure you absolutely understand the struggle of thinking something is going to go according to plan and then that plan totally going to crap! It’s been the story of my life since moving to the homestead, but I am learning to go with it and work with it! Well, I guess I had the same answer, just a different word for it – I was going to say adaptability. Such true words. So very true. We just had a predator problem not all too long ago, and we couldn’t just give up, we had to deal with it!